You are never too old to have healthy teeth and gums, and you do not have to lose your teeth as you get older. If you do lose one or more teeth you can have them replaced with either a full denture, partial denture or an implant supported denture. Our team will always help select the best option for you. From cosmetic repairs to denture relines, our Edmonton clinic specializes in maximizing your overall comfort. Gum disease is one of the main dental problems adults face. Here are some things you should know about gum disease. The fillings in your teeth are not as smooth as the surface of your natural teeth. Tiny bits of food and germs (bacteria) can get stuck at the edge of a filling. This can cause a cavity. Also when a filling breaks the part of the tooth that is no longer covered is more likely to get a cavity. Years of brushing your teeth too hard and/or grinding your teeth can make your gums recede, or pull away from your teeth. 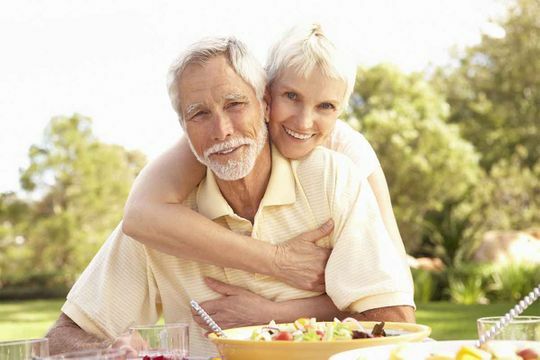 Getting older can also make your gums recede. When your gums pull away from your teeth, the roots of the teeth are out in the open. Roots do not have a hard, outer layer (enamel) to protect them, so they are more likely to get cavities. Regular checkups along with regular brushing and flossing are the most important things you can do to keep your teeth in good shape. A yearly visit to the dentist is recommended. If you do happen to wear a denture, remember, even the best fitting denture is only a prosthetic replacement for your missing teeth. Book your checkup with us today.